The following recipe is perfect for fitness fanatics, those trying to eat clean and those following the 5:2 diet. It is really easy to prepare and also freezes really well so perfect for batch cooking for weekday meals. It is also really tasty! 4 dashes hot sauce...or as many as you like! In a large casserole dish gently fry the onion until soft and golden. Add the turkey mince and heat gently until browned. Stir in the chopped peppers and heat gently for ten minutes. Meanwhile in a small bowl mix together the fresh chile, chile powder, malt vinegar, sugar and tomato puree to a smooth paste. Stir this into the casserole. Stir in the chopped tomatoes and season. Leave to simmer, covered, over a low heat for 40 minutes. Finally stir in the kidney beans and a few dashes of hot sauce and simmer for a further 10 minutes before serving in warm bowls. On it's own this is a great low fat meal and perfect for those following the 5:2 diet or eating clean. It is great on it's own or could be served with a dollop of low fat creme fraiche and/or a small serving of brown rice if required. If you're not counting calories a bit of grated cheese on top is also a great addition. 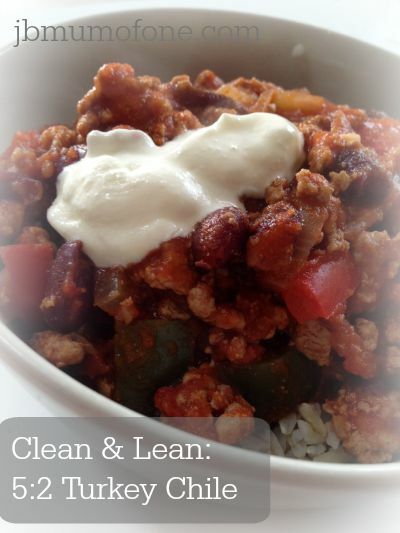 For more clean and lean or 5:2 recipe ideas why not follow me on pinterest?